Well, this was a cool building and decent museum, with mostly New Zealand paintings. The picture there to the left is a large artwork hanging from the roof of the foyer. 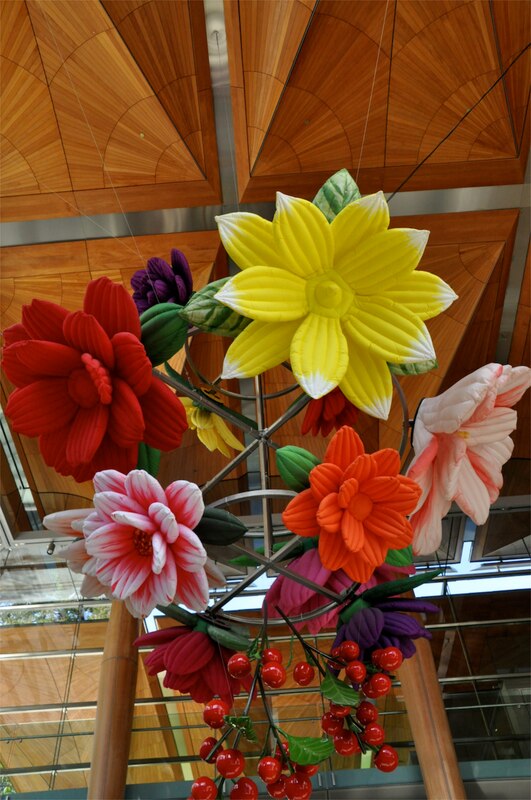 The flowers are puffy fabric, big, and open and close individually by a (somewhat jerky) robotic mechanism. Actually pretty cute. Many of the painters in this museum – guys you never heard of – had gone to Europe to learn and hob-nob with the giants of the day, such as the Impressionists and Cubists, and returned to NZ with these new ideas, but my reaction to the NZ art, with two exceptions, was rather negative – the art was nice, but didn’t seem to add anything new. I’ll present a few (very few!) of the old-style pictures I liked, and then show the two exceptions. A short post! OK, I lost the title and painter on this upper left one. The subject is a (defeated) wounded soldier being treated in a sympathetic town. I liked the setting – the beams/tree trunks of the barn, the Dutch-master-like treatment of the black dress and lace. Very romantic, don’t you think? The image on the right is by Edmund Leighton, “Un Gage d’Amour”, 1881. An Englishman, not a Kiwi. Nicely done, really. Romantic theme. Am I a sap, or what? The bottom left is a very large painting of a child funeral by Frank Bramley, “For such is the kingdom of heaven”, 1891, an Englishman rather than a Kiwi. Hmm. Is there a pattern here? The painting very much reminded me of John Singer Sargent from about the same time. The last image (engraving) on the right is by Albrecht Dürer, “The virgin and child with a monkey”. Yeah, not a NZ artist. Definitely a pattern. I love Dürer. The work is fabulous. The monkey? I dunno, whatever sells, I guess. OK, let’s do 2 NZ artists. The first guy is not a professional painter; watercolor was just a hobby. 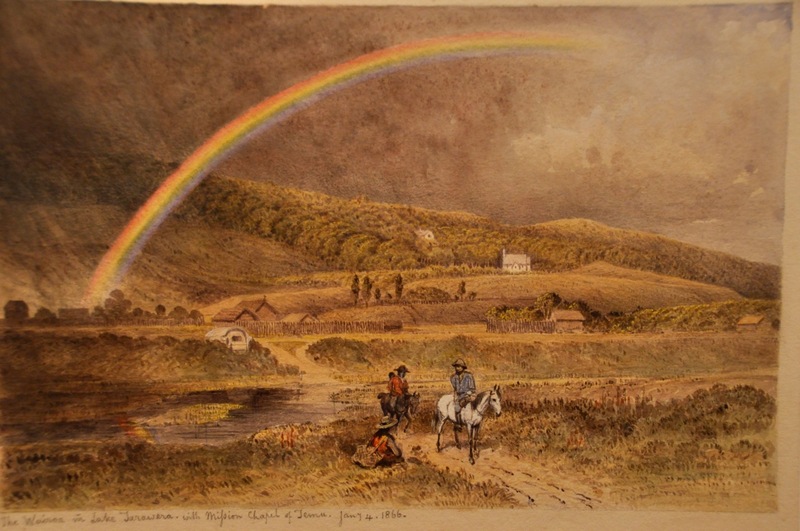 This is John Kinder, “The Wairoa near Lake Tarawera with MissionChapel of Te Mu”, 1886. There were a bunch of these paintings, and they were wonderful. Kinder is important historically because he captured early times of European NZ settlement. He’s an interesting guy – a top-notch mathematics student, he switched studies to become an Anglican ordained deacon. After a decade of strict application of high church religious observances at his first position in England, the town asked for him to be removed. Oops. So that’s when you hop in your canoe and set off for the horizon, and he accepted a position as headmaster at the Church of England Grammar School in Auckland. He did well, and he did a lot of paintings, thank you. The other NZ painter I liked is a lady, A. Lois White, and the pictures were from the more modern 1930’s and ’40’s (Picasso time); and like many then, she was a Socialist. The first line drawing is a subject common for that time protesting Nazism and Capitalism; I thought it well done, and might it apply today to capitalism? My how some things don’t change. The next three I loved because I found them different; such an interesting use of repetition! And space-filling! And hints of art noveau? The line drawing is “Study for collapse”, 1944. The upper right is “Funeral march”, 1936. Lower left, “Pattern inspired by rain”, 1941 (and I like the subject matter). Last, “Jonah and the great fish”, 1945. That’s all for now. Next post, we’re leaving Auckland for the great beyond. WoooHoooo!! !